​I will be traveling soon but wanted to say thank you to all of you before I hit the road. Although the Thanksgiving holiday is, and always has been, one of my favorites, my husband and I, in our new tradition will be on the road — 81 South to be specific — traffic is light. 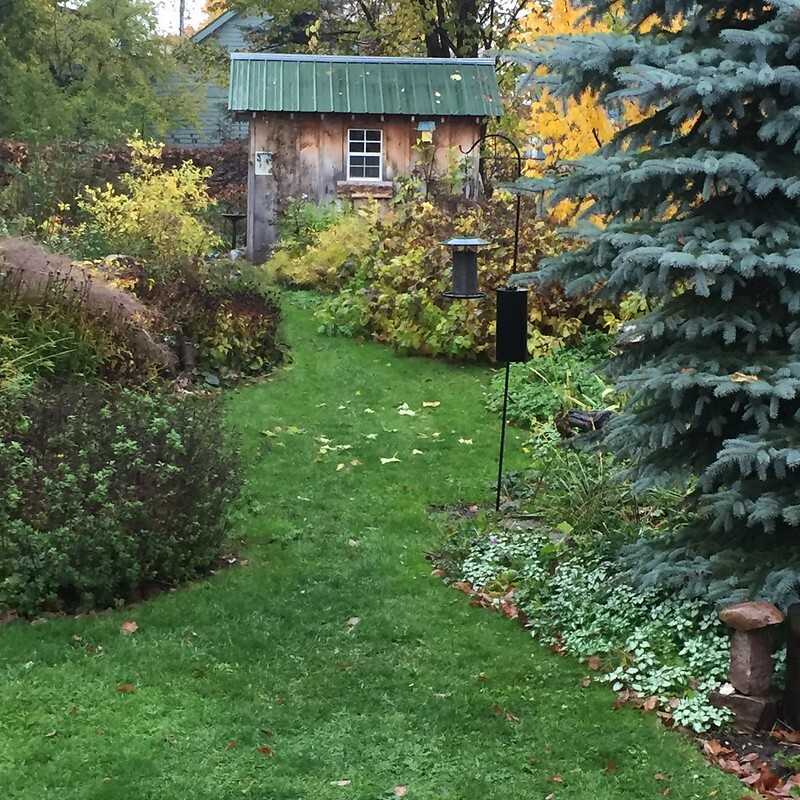 We leave the day before and stop at my mother's in the Syracuse area, affectionately referred to as Bonnie's B&B, to gather together before we all face winter. Because some of our family is now living a meat-free lifestyle, the Thanksgiving turkey has lost its appeal. We will be ordering Thai this gathering to forgo any additional cooking, but Mom has made a Pumpkin Pie! We will celebrate birthdays, including mine (I'm at "halftime" — yikes!). We will count our blessings. One of my many blessings is you, my readers who have been with me maybe only a short time or maybe since my first rooting on Blogger and I thank you. My husband and I take our time heading South and will not arrive at our winter rental residence until Dec 3. We will stop in Asheville and celebrate "Food Fest." Asheville has many delicious plant-based restaurant offerings and since my husband and I don't eat out regularly (with the exception of an occasional Friday Wood Boat Brewery pizza here in Clayton which I recommend if you are this way), we tend to gorge ourselves in Asheville eating out enough to make up for the entire year! We are also making a stop in St. Augustine this year. St. Augustine is the oldest city in our great nation and I look forward to it. It seems to boast many art galleries and many ghost tales. I think I will also make a stop to the Fountain of Youth — can't hurt to call a time out before halftime. At our final destination in Cedar Key, an hour west of Gainesville, I will set up my temporary painting studio and paint, paint, paint! It is a time of year I look very forward to. The only distractions are nice weather, kayaking the surrounding islands, and the tiki bar. I put down my pruners and my shovel and I pick up the brush. I become so inspired but this year have a long list of paintings I wish to complete going in (because it helps to stay disciplined): an attempt at a dragonfly, a loon painting which I've unsuccessfully attempted before, a heron painting, a pelican, the third in the moth series, an ode to the Monarch butterfly, another Clayton Skinner fishing lure, and a couple in a new series I am planning entitled "oh, the places you'll go." In addition, I have a special commission to work on that I look forward to. I will also be finalizing some sort of business plan perhaps with a workshop or two, some sort of "event," a private exhibition debut, and a yearly traditional holiday offering. Again, I look so forward to this time because I can breathe and my focus becomes much more narrow. It is a relief! In the past I have taken a break from all gardening, but this year I have secured a spot in the Cedar Key community garden! It will be interesting. I secured the spot because I want to learn about gardening in this different zone. I look forward to fresh herbs and greens in January! I am also bringing a few more plants down than last year, of course. 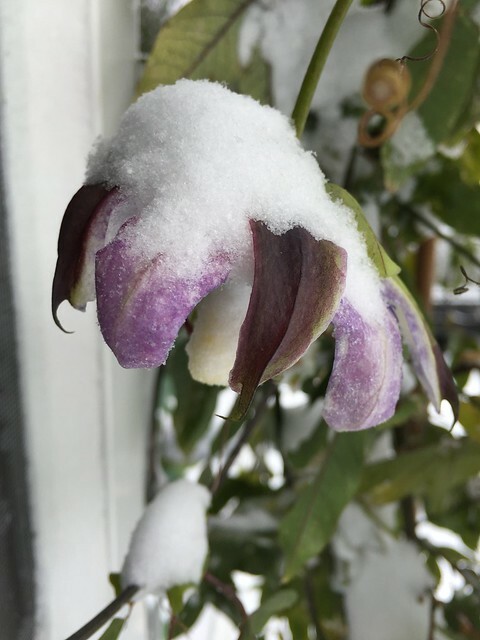 Right now, my Passionflower is iced in snow as we are in the midst of our first snow storm. I feel so bad for her but I want her to know it's time to go dormant. She will be moved to the cellar before we leave where she will overwinter in relative warmth. She is only hardy to zone 6. I know this will work because she is in her second year! It is so sad to see her beautiful blooms covered in snow. She bloomed right up to the end and still has buds. 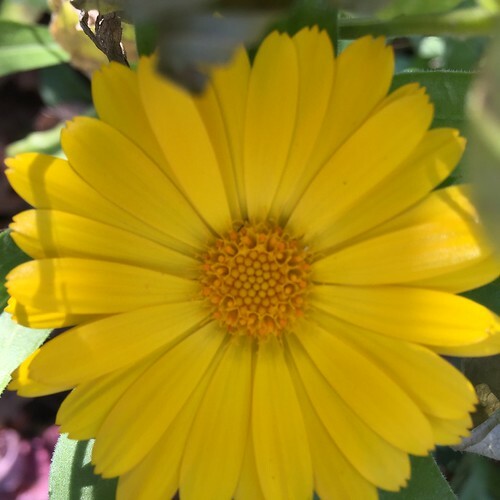 Just this past Saturday it was 60°F and this Calendula flower opened. ​Today, Monday, it is like this outside and I am grateful to be indoors conversing with you. The garden has been tucked in, in the knick of time. The Potager beds have been cleaned up and mulched with a thick layer of leaves. Now held in place with extra scrap wood — the first batch was wind blown away — and under snow. I planted over 100 more bulbs: iris, alliums, and daffodils. 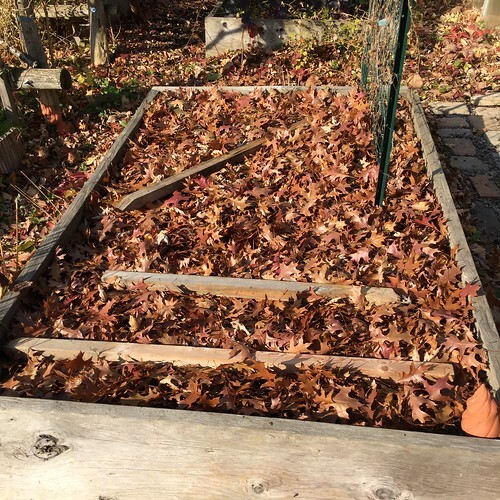 There are still some weeds and areas in need of attention throughout the garden, but I did a lot of pruning, and cleaned out the greenhouse where I hope to be offering plants for sale come Spring. 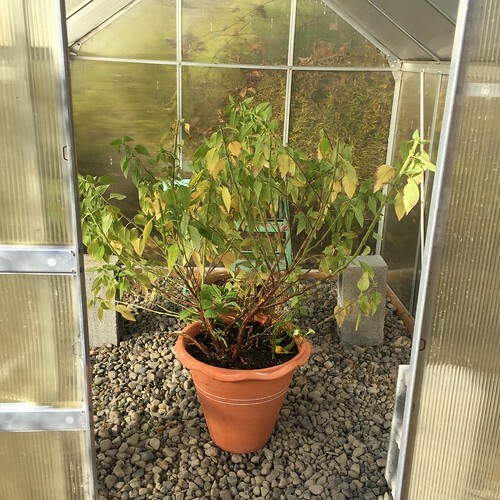 I am overwintering two pots in the greenhouse this year as an experiment. This is my beloved Pineapple Sage which finally bloomed when I moved it to the front porch because of its size (this is actually cut back). So now I think it didn't receive enough sun on the back steps. 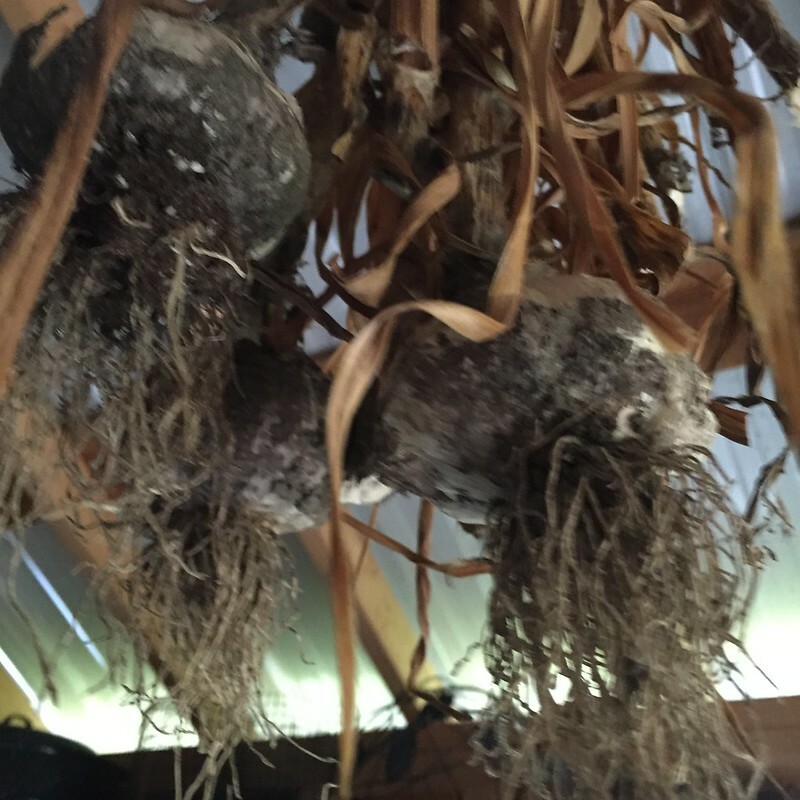 It may survive if its roots can seek water through the bottom of the pot. I believe it is hardy to zone 6 and the greenhouse should shelter it. I'm thinking that the lack of water will also prevent the pots from cracking. Only one way to find out — try it. All in all, I feel pretty good about the progress I've made in the garden. Now, she is really tucked in under a blanket of snow that I have a feeling will be there until the end of March. ​I am truly happy this year to be making my escape. I have been counting down the days "creatively" which you can follow on instagram. This snow storm is reminiscent of Januarys past and I can now truly say I do not miss Winter. Admittingly, at times I would become nostalgic for winter: reading a good book by the fire, snuggling in blankets, mac-n-cheese (cashew) baking in the oven, feeding and watching the winter birds ... but in one day I am reminded of the "real" winter. Our sliding door is iced over with a drift of snow and will not open. The birds are absent — seeking shelter from the storm I'm sure. The few I see look so sad braced against the wind, their feathers ruffling. The driveway is all ice and we have to use our front door to get in and out of the house so there is snow tracked all across the carpet. The wind will not stop howling and you can actually feel it as well as hear it, seeping through every tiny crack in the house. Energy is down, hunger is heightened and it's a safe bet another bottle of wine will be polished off this evening. The winter weather here is distracting. It envelops all, smothering all with a heavy layer of apprehension. A depressing weight ever more omnipresent with the gray skies and dark days. I could try to be positive but all I can think is thank god I'm getting out of here and the tiki bar is open! which I guess, in a way, is positive! 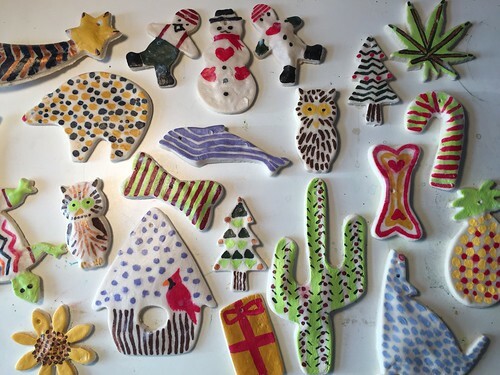 This photo is of painted cookie dough ornaments I created for the TI Arts Center tree entry in the Festival of Trees in conjunction with PAPTIR (Plein Air Painters of the Thousand Islands Region) on display at the TI Museum in Clayton. I plan to recreate these in clay/ceramic with the help of the animated Serena Buchanan (THE potter at the Arts Center) to offer in my gallery in the future. I was nostalgic for sugar cookies which I used to make growing up with my mom and sisters. We would paint them with colored egg wash. I haven't made them in years. I am feeling nostalgic for Christmas this year and will bringing some of it with me down to Florida to decorate. If you would like to make your own cookie dough ornaments, I followed this recipe. 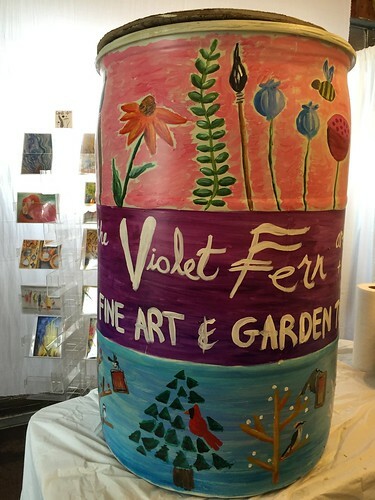 I also managed to decorate this sand barrel that will appear on the streets of Clayton before leaving. I am blessed to be a member of two great, small town communities. Although my husband and I aren't physically present in Clayton for the winter, we try to keep one foot here by donating to local organizations or volunteering in some way. The proceeds from this sand barrel will go towards the Clayton Christmas Parade fund. I love that Clayton "decorates the town" with these barrels that are also useful in keeping sidewalks "walkable" during the snowy winter months. In the spirit of giving thanks and making merry, my prints, greeting cards, pillows, and totes offered online at thevioletfernartstudioandgarden.com are all marked down 25%. Simply use code FVDJRG when checking out. I wish you safe travels, friendly gatherings, and the spirit of the season. Thank you so much! The next time I connect with you it will hopefully be from sunny Cedar Key. Wait a minute, scratch that ... Snow is falling all around, it's really time I was on my way? We had our first snowfall on October 27. Admittingly, that is early even for North Country, but boy did it make me realize Winter is indeed going to arrive in spite of our extremely warm temperatures and mild weather. But back to today; again, mild temperatures and for now I smell the rain. I'm going to be upfront, this post is going to sort of "ramble on," maybe even for too long, definitely for too long, as my mind has been rambling around and the days are counting down to our migration (21), and I've been mulling over what to share with all of you. Get some coffee, or tea, or bonbons, or something and settle in. In the garden I still have to clean/prep the garden beds and plant the garlic. Before I eat it all! Really eyeing — out of focus — those biggest bestest bulbs now! They are hanging from the roof inside my shed. I've, sadly, clipped most of the smaller bulbs to eat already. 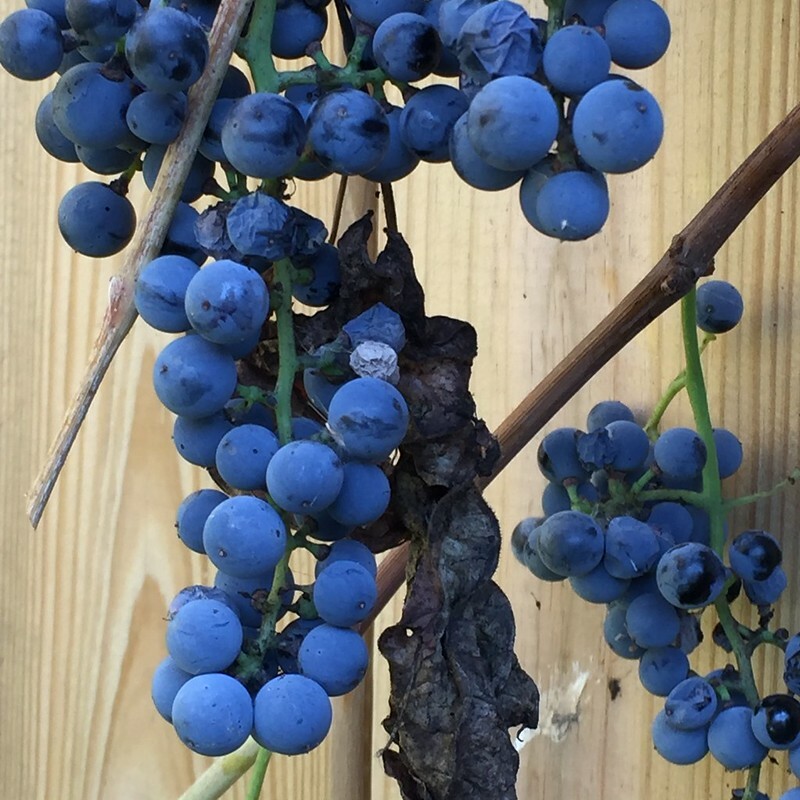 I was going to get to all that ripping-out-tomatoes-and-planting-garlic-and-topping-off-beds yesterday (when it wasn't raining), but ended up pruning — grapevines out of the trees, the Amur (invasive) Maples away from the garage walls, the White Pine so I could walk completely around the garden ... on and on. I love being back in the garden with my full being, letting it take the wheel and guiding me as to what I should do. I love to be able to steer away from my agenda. My new favorite saying is "everything is progress" so I ramble on. The grapevines I curse sometimes, but then, this ... So beautiful! I also drained the water container garden and pot underneath the rain chain (so it doesn't crack again). My water lilies that I left out last winter never did come back and I so loved them underneath the rain chain that next spring I will order or pick one up again. In the water container garden I had only a few plants — a curly rush and I think "Little King Tut" Papyrus which I planted in the ground but now realize that the Papyrus will have to go in the cellar if it is going to survive. I still have bulbs to plant and a few more "ceramic" items that need to come in for winter protection and I don't have much longer to get things done! I also need to spend some more time in the Park cleaning up — I am not a believer in cutting back the garden before Winter but that is what they want and so I shall do. Of course, I'm totally procrastinating. There are some beautiful things happening in the Violet Fern garden. 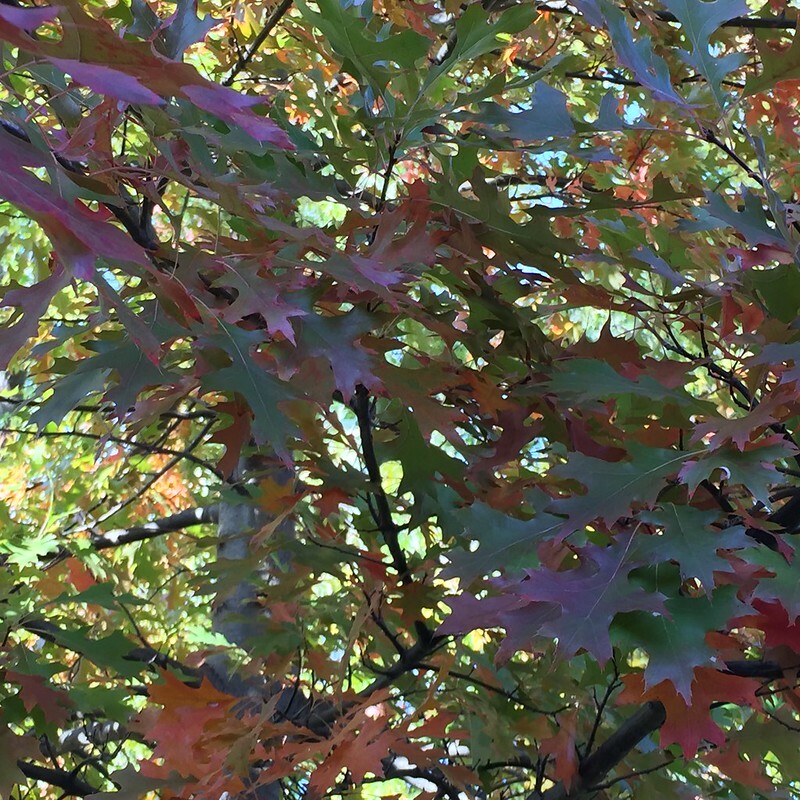 The Pin Oak is beginning to show off. 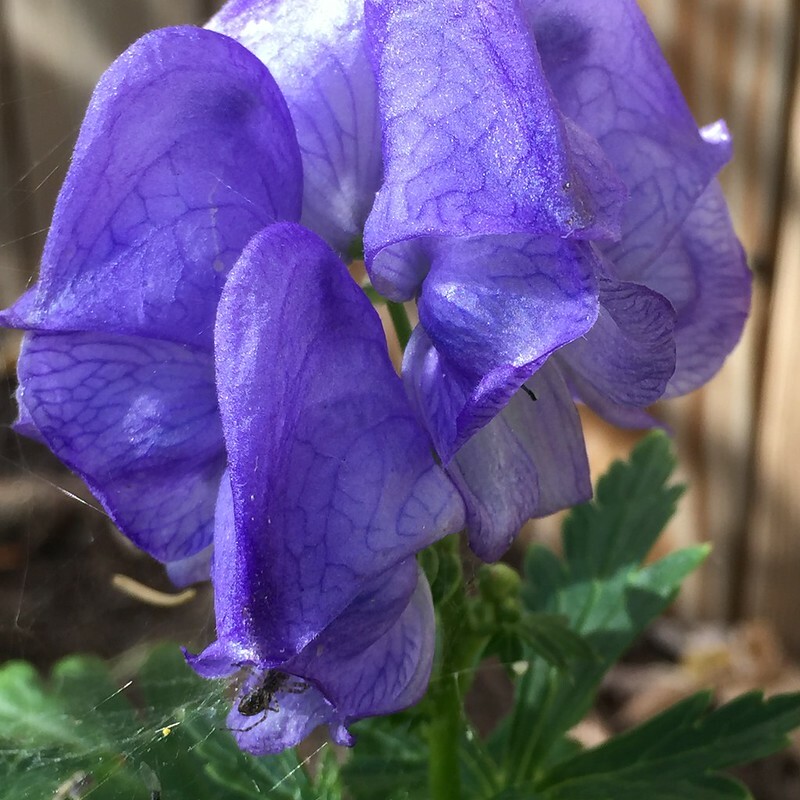 Newly re-planted Monkshood is blooming. It is almost as bright as those grapes! A beautiful late pop of color. I have been painting. I am currently working on a series of three paintings starring moths as I mentioned before here. I finished up Luna Moth and I am happy to announce that both Wooly Bear and Luna Moth were accepted into the 68th Annual North Country Arts Council Fall Show. I will be framing them and dropping them off at the state building this Sunday in Watertown. 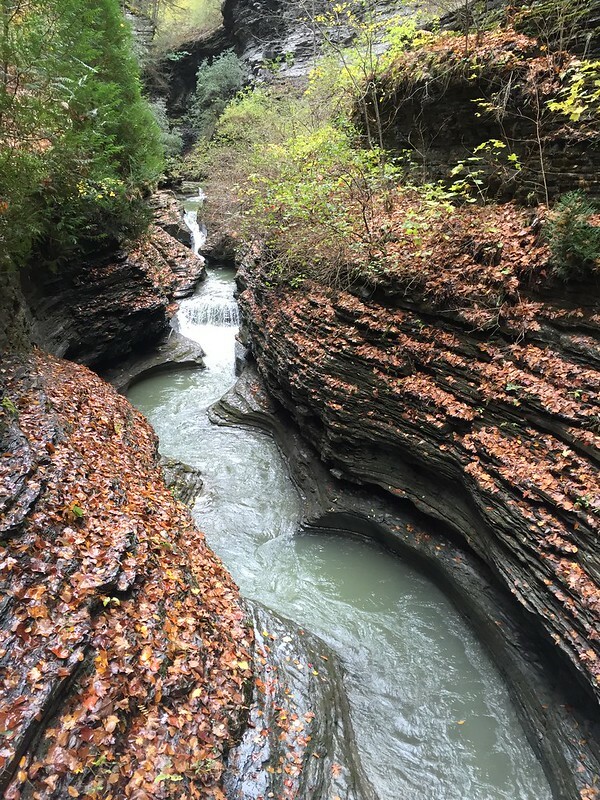 We, my husband and I, actually took some time for a little get away in our own backyard! You know the "ol' we live here but we have never been" conundrum. 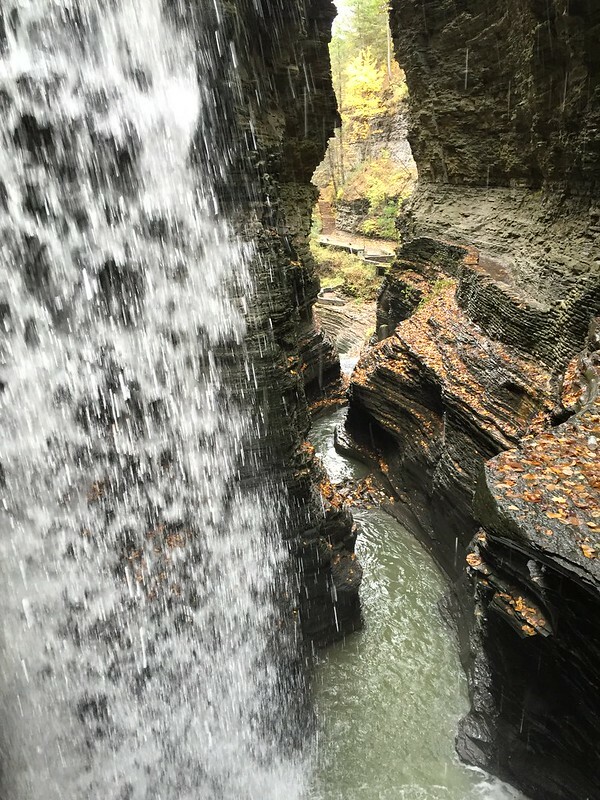 My sister organized an extremely fun wine tour of Seneca Lake (one of the NY Finger Lakes) to celebrate my Mom's birthday — I won't say how old but I will say she's very young for her age! Because it was so close to Halloween, we decided upon a group costume. My Dad's name is Ned and over the years we've come to call him "Grateful Ned" so we (family, friends) toured as the "Grateful Ned Tour." It was all about treats — so many wonderful wineries and breweries, and even distilleries, surround this lake. We were very "grateful" to have a driver keeping it safe while we imbided our way around the lake. My favorite winery, Billsboro, doesn't allow buses or limos because it is smaller but my husband and I extended our weekend so we visited Billsboro on our way to Farm Sanctuary. Our extended weekend was intended to visit Farm Sanctuary in Watkins Glenn, something I have been wanting to do for the past few years. 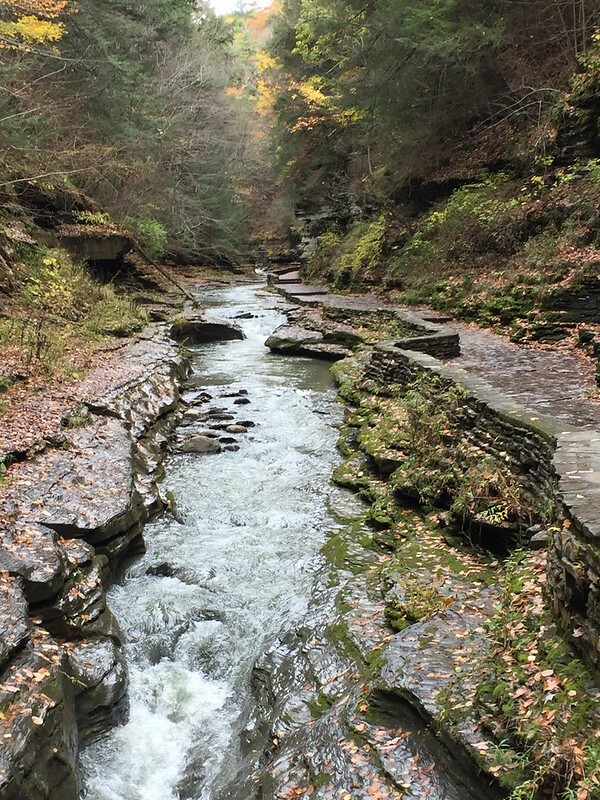 Watkins Glenn is perhaps better known for racing or, more my speed, Glenn Falls Gorge in Watkins Glenn State Park. So now we're rambling on to must-see-places in the real NY. 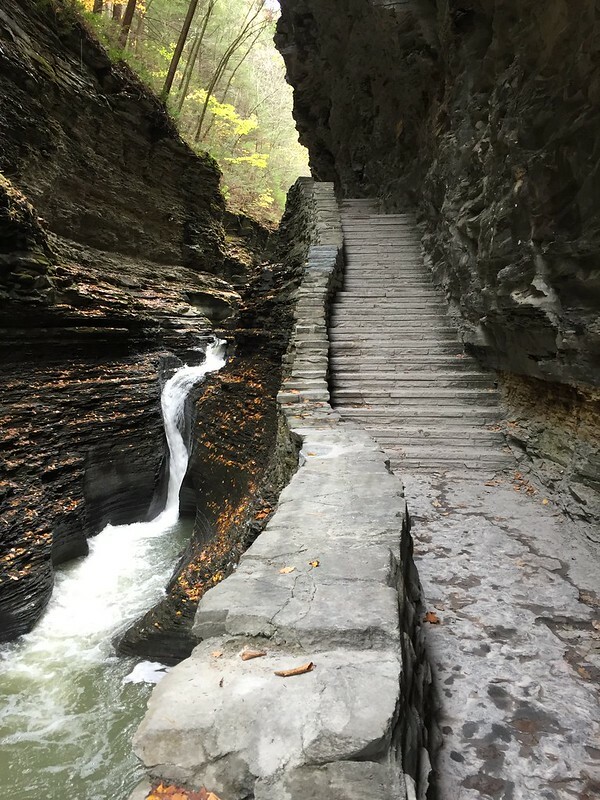 Wine tours in the Finger Lakes and Glenn Falls Gorge are definitely on this list. More about Farm Sanctuary a little further on in my rambling. The day of Halloween I spent closer to the dead by risking what seemed to be a thousand flights of stairs. I survived only because the view was so distracting. 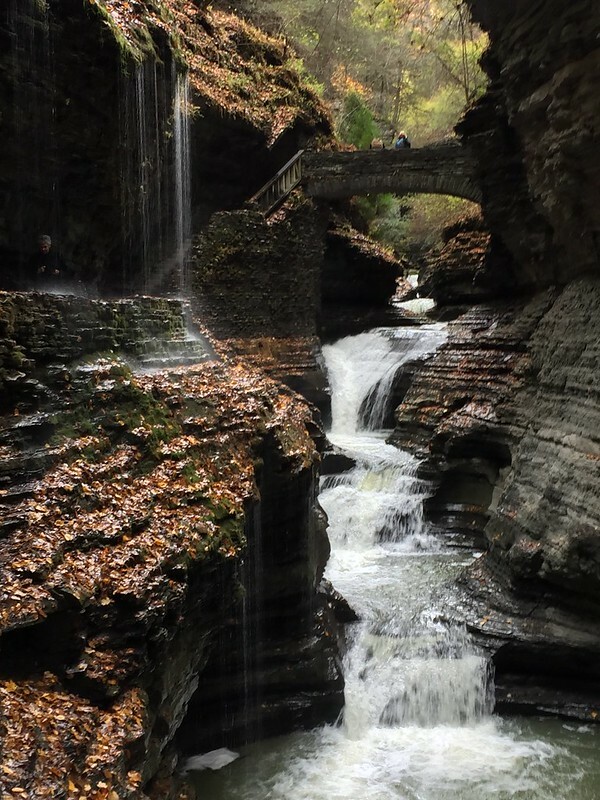 I am ashamed to admit I had never been here before — such beauty in my "backyard." No need to travel the globe. I will let the pictures speak for themselves as I am certain you are tiring of my ramblings. Please don't be put off by the climbing — it is gradual and comfortable with many places to rest along the way. The real reason for our extended weekend, was a trip to Farm Sanctuary. What pray tell? The Farm Sanctuary's mission is "to protect farm animals from cruelty, inspire change in the way society views and treats farm animals, and promote compassionate vegan living." Most of you who read my blog already know that I swore off all meat and dairy, aka went Vegan, four (four???) years ago and committed to a plant-based diet, by choice, not for any impending doom health reasons. It was my husband who actually steered us on this course as his father suffered for years, miserably, with heart disease and non-ending doctors' visits. Long story short, my husband did not want to follow in his father's footsteps, the research on prevention he came across consistently pointed to a plant-based diet and so we altered our lifestyle. This choice of lifestyle is also to the benefit of animals raised for food — compassion is a wonderful side effect. I simply wanted to see this firsthand as I love animals, and the sanctuary is after all, in our "backyard." Am I a perfect Vegan? Absolutely not, but I don't want to ramble on about Veganism or plant-based nutrition (you can read more of my take on that in this older post if you wish). 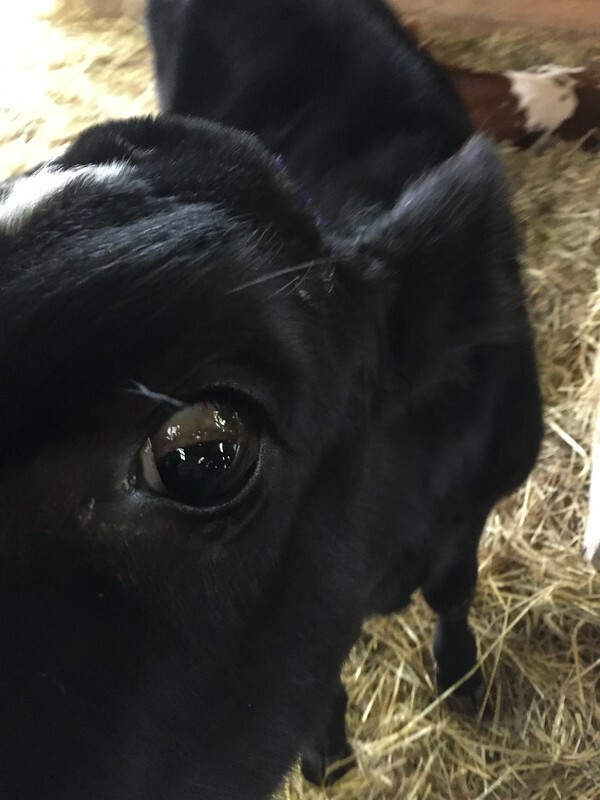 I want to introduce you to some of the animals on Farm Sanctuary in Watkins Glenn. They all have stories, most of them horrible, but I will not go into that. Just "see" their personalities if you will. It was such a joy to meet and learn about these fellow creatures. We had a wonderful guide to answer all our questions as we met the animals. A dirty little secret of the dairy industry is that born male calves are often discarded and left for dead. 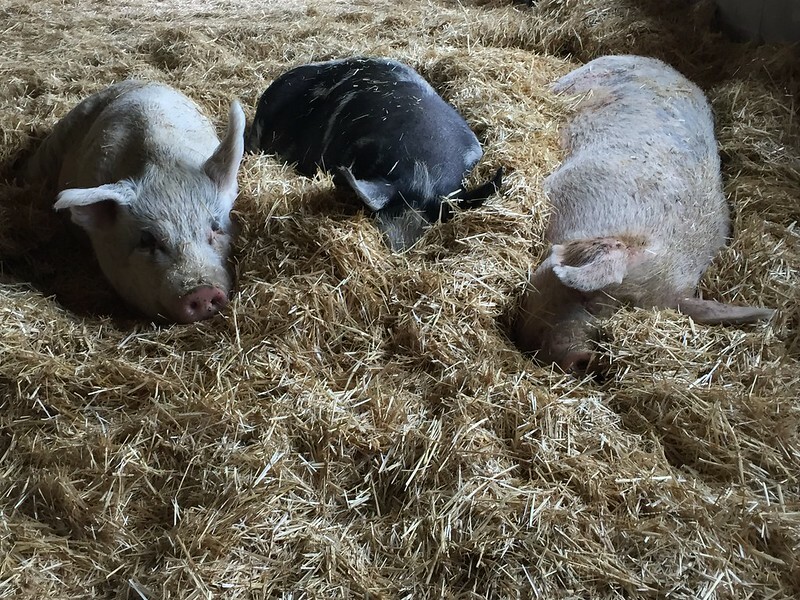 Farm Sanctuary has offered life to a number of them. Meet Wellesley, he is so so sweet and he followed me around nudging me to lick the umbrella I was carrying. I also especially enjoyed meeting the turkeys! They are so curious and rather than gobble, they actually sort of coo-coo-coo. For the past three years I have been adopting a turkey around Thanksgiving rather than eating one. Two of the turkeys I've adopted, Elsa and Jackie, are at Watkins Glenn so I was able to meet them! I was curious as to why they are white because hey, the ones I see in the wild are definitely not white. The answer I received was sobering. They have been bred overtime to be white so that their skin will not appear blotchy with pigmentation because it is less appetizing to consumers. You might also notice that their beaks look "chipped." It is common practice in the industry to remove with a hot cutter the tip of turkeys' and chickens' beaks to prevent them from pecking at each other — a side effect of being in close confinement. 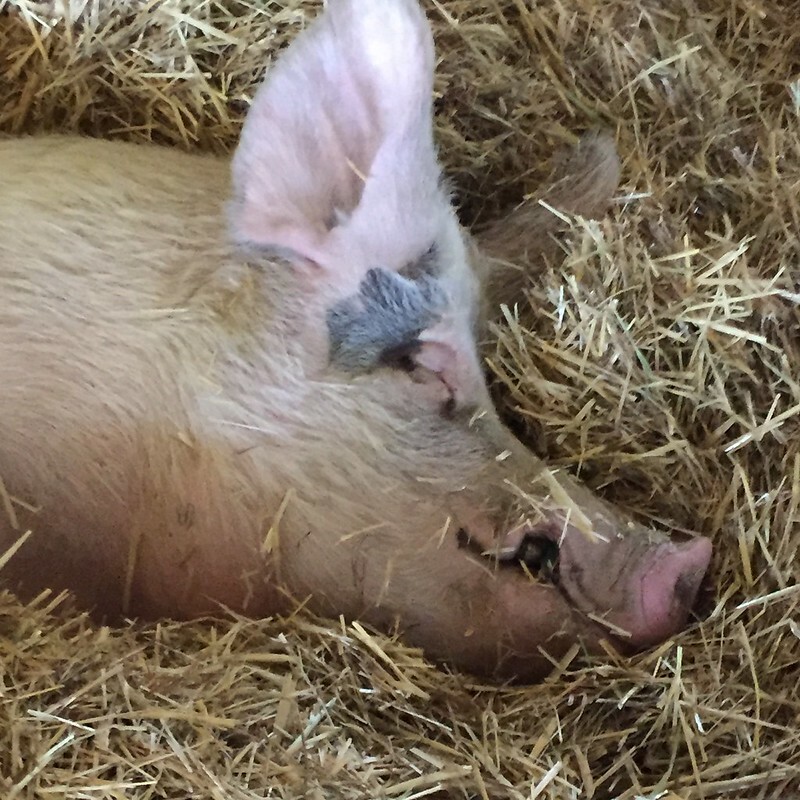 Did you know that pigs sleep 18 hours a day?! A dark, drizzly day like today I wish I could, too. Here is Andy being a pig. When I pet Andy I was amazed at how coarse his hair felt — like a bristle brush — it was cool. And this, from left to right, is Violet (love the name! ), Joan (as in Jett), and Truffles. Pigs make a "nest" to bear their young when allowed to live naturally — this surprised me. 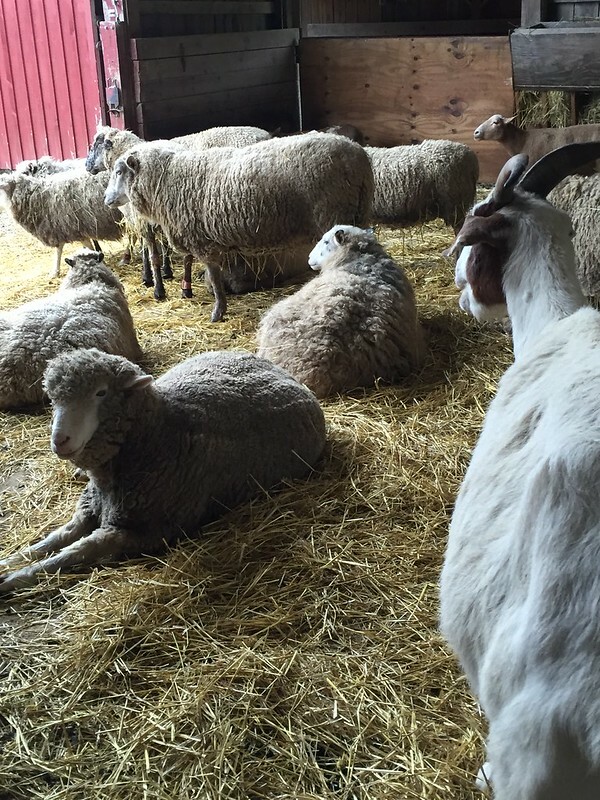 I also loved being submersed in the sheep barn — extremely calming. All at once, collectively, they began to stroll out of the barn. It was "decided" that they would go out to pasture although I myself, did not hear the discussion. When you meet these creatures up close and personal, it is obvious and moving that they are sentient beings. 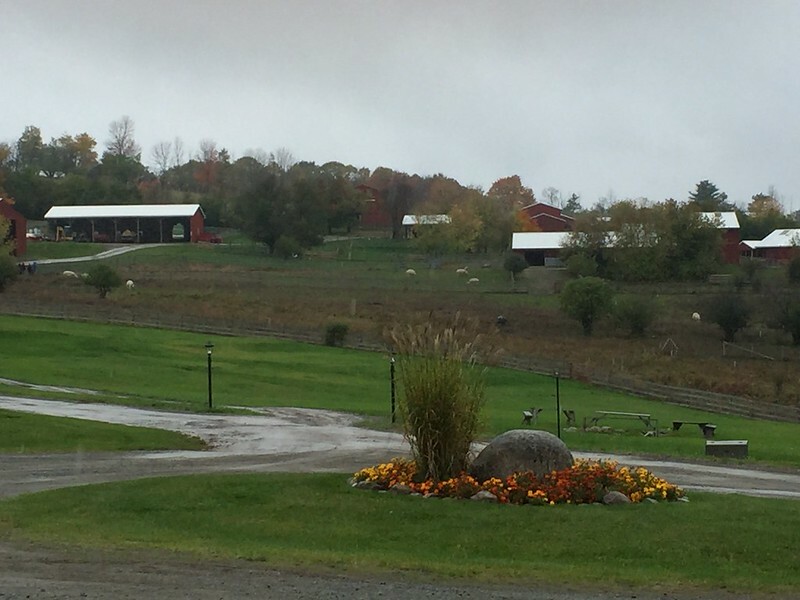 And while I wouldn't say Farm Sanctuary is a must see on the list of things to see in NY, I will say it is something to see that will enrich your life and change you in some way. I hope you might consider a visit and support Gene Baur's vision, the founder of Farm Sanctuary who unfolds an interesting story himself including selling veggie hot dogs out of his VW van at Grateful Dead concerts — as in the real Grateful Dead. 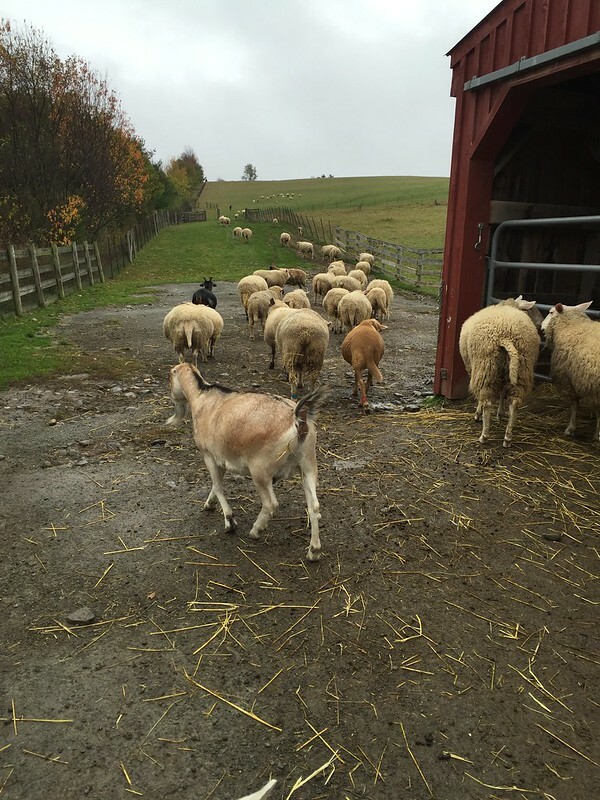 You can read more about Farm Sanctuary in Gene Baur's book Living the Farm Sanctuary Life because I think I've rambled on enough! Ramble on and now's the time, the time is now ... on my way.